﻿ 10 Best Email Drip Campaign Examples » Red Mango Marketing! Building out an email marketing campaign seems fairly simple. All you need to do is draft amazing content, add some eye-catching graphics, find your email list, and hit send. You have the opportunity to reach out to your customers whenever you want, keep them abreast of what’s going on at your end, ask them for feedback, and even introduce them to your team. But what happens when a new subscriber only receives your new emails and misses out on the amazing content you shared earlier? You can’t send them all the older emails in one go, nor can you give them a link to view the emails. No one’s going to spend that extra time. Drip email marketing campaigns are a set of automated emails that go out based on specific timelines or user actions. Also known as autoresponders, email drip campaigns are a set of marketing emails which are sent out automatically based on a schedule. One email goes out when someone signs up to receive your newsletters and is added to your email list, another the following week and perhaps one more the next weekend. Email drip campaigns can also be based on certain triggers using marketing automation – If someone signs up for a free trial on your website or makes a purchase. These emails can also be called “behavioral emails”. Research has also shown that pairing marketing automation with email drip campaigns leads to 20% more sales opportunities. Email drip campaigns have a host of benefits to offer if implemented correctly. A little time and effort in the start go a long way. Emails triggered based on user actions have a better chance of getting a response than standard email campaigns. Drip email campaigns allow you to engage your prospects better and much more efficiently. With the use of an automated drip marketing campaign, you can lead users through the entire buyer’s journey – from acquisition to the “buy” button on your website. Whenever a user leaves an unpurchased product in their cart, use a drip email campaign to follow up and let them know that the product is still available for purchase. Your drip emails have a pretty good chance of closing the sale. According to SaleCycle, abandoned cart emails average a 46.1% open rate, a 13.3% click-through rate, and $5.64 per email in extra revenue. You could also send recommendations based on a user’s purchases or browsing history on your e-commerce store. This doesn’t necessarily only apply to physical products and services, but also for streaming apps and games. As a small business, you might find it difficult to hand-hold every lead who has the potential of becoming a paid customer. Drip emails are automated and can be crafted to be sent out at a particular time and to a specific audience. The mark of a good drip email campaign is the prospect of not even realizing that it’s a pre-written automated email. The more personal you make it, the more chances you have of readers responding favorably. When it comes to lead nurturing campaigns, one size does not fit all. You need to strategically nurture your leads using tailored content which will help to improve the results of your email marketing strategy. According to research by Demand Gen Report, leads nurtured with targeted content produce an increase in sales opportunities of more than 20%. 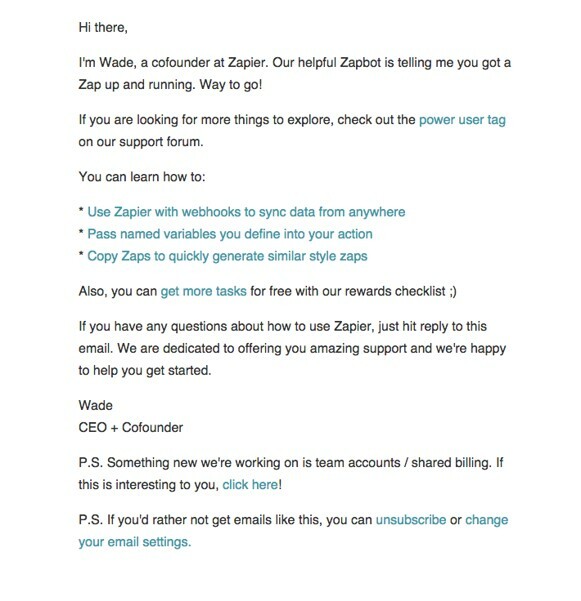 Zapier sends new subscribers a user onboarding campaign to help them get started. They’ve listed out the different things you can do once you’ve activated your account (essentially walking them through the customer onboarding process) and also added incentive by talking about their rewards program. The overall goal, as with all welcome emails, is to create trust and motivate those key first actions. As a small business, you might not have enough time and resources at your disposal to handhold every new subscriber, and that’s where an automation campaign steps in. You can add new subscribers to your existing email automation lists and send them relevant emails which are triggered whenever a particular action is performed – moving them further and further down the purchasing funnel. The first email a new subscriber receives is the welcome email. These are extremely important for they set the tone of your entire email campaign. If your welcome emails don’t resonate with your audience, there’s a good chance that they’ll click the unsubscribe button then and there. Therefore, you have to get this right if you want to retain your subscribers and turn them into paying customers. Google Adwords welcomes new users with an email that inspires trust, is visually appealing and the subject line draws recipients in with a reference to a task they’ll want to complete. 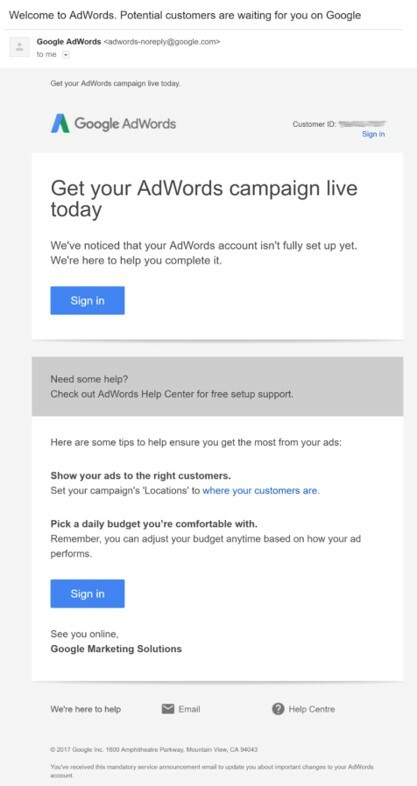 Upon creating an account, you will receive this email from them that reminds you to complete setting up your Adwords account and links to their Help Center. Getting users to sign up for a trial is great, but the eventual goal is always to get them to make a purchase from you. That’s where an onboarding drip strategy comes in – Once you’ve sent in a welcome email which introduces customers to your brand, the ensuing step is a user onboarding email. These emails offer targeted “sells” informing your customers of what the next step is. 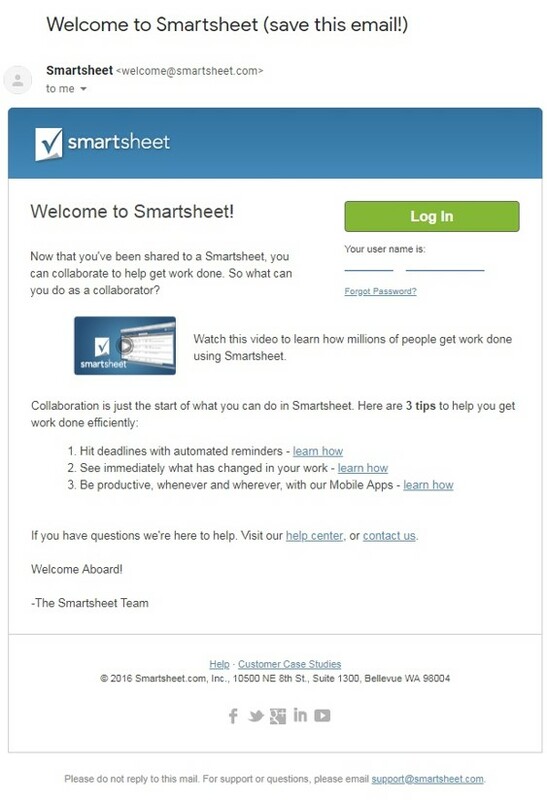 Collaborative and work management tool Smartsheet employs onboarding drip campaigns to teach people how to use their product. The best way to connect with your customers is to look at your business through their eyes. Talk about your business, but focus on what’s in it for them. Needless to say, a client onboarding email needs to be simple and smooth. You want your customers to quickly have a feel about your business without making it sound too technical or content heavy. Don’t forget to highlight the advantages too. Reinforce the value and show how your product/service can help them achieve what they are looking for. People love hearing about themselves – Being tagged in pictures on social media – your brain lights up when that notification pops up on your phone. As a business, you already have a lot of data about your customers – their likes, dislikes, birthdays, anniversaries and so much more. How can you use that information to teach people something about themselves? An engagement drip campaign email is not only a compelling email to open, but it also motivates people to re-engage to gain more insights about their behavior and progress through the customer journey. 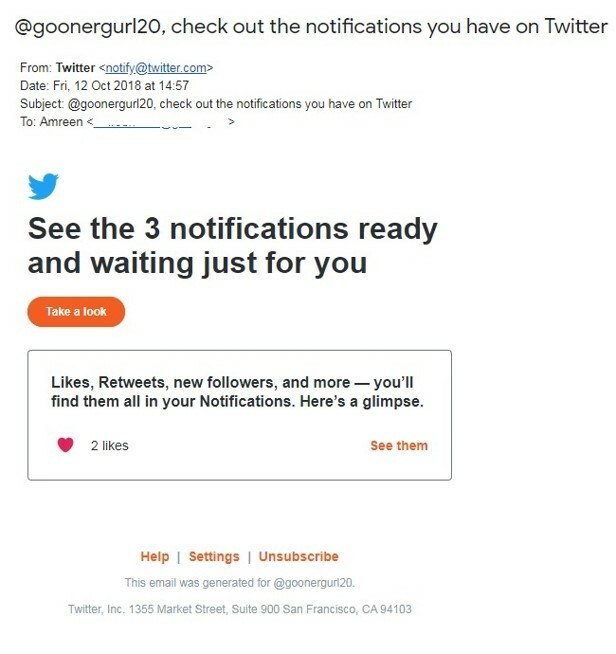 Every day, Twitter sends a customized email informing you of the notifications you have. It’s great to wake up to this email – everything in a glance. Twitter isn’t waiting for you to fire up their app: they’re providing you added value and delivering it straight to your inbox. Users whose interest is piqued by this email will click on the call to action to visit Twitter and find out more. Once a customer begins engaging with your business more frequently, it’s easy to collect their data and send them highly personalized emails. The best part? You don’t need to discount prices or offer a promo code. Simply curating personalized product recommendations is providing value enough to your loyal customers. Penguin Publishing uses a customer’s browsing and purchase history on their platform to offer up related books. They highlight book reviews and stores where you can purchase books from. The more a company knows about you and your buying habits, the better they can predict what you will and won’t like. With that info, they can send you targeted drip emails that contain products or coupons specific to your purchasing tendencies. The same goes for an entertainment app like Spotify—its team knows what music you listen to, and they can create targeted drip campaigns that email you whenever a frequented artist releases a new single, or when a new band in your favorite genre signs on with Spotify. You don’t need to shell out millions on your email marketing budget to put this knowledge into action. You can target user segments with drips based on which aspects of your services they use and tailor content according to their needs. It may not be possible to persuade all cart-abandoners to go through checkout and triple your sales. Some customers may have never had the intention to purchase in the first place. But it’s worth putting in the effort to resolve as many lingering hesitations as you can because a significant percentage of them are persuadable. Online retailer NNNow sent me an email three days after I left some items in my cart. Right from their subject line, they’re creating a sense of urgency – “Buy now before it sells out”. Along with telling me what I’ve left behind, they’re also giving some recommendations and a reminder to an on-going sale. Clicking on any of the links mentioned takes me back to my cart. Abandoned cart emails are, in a way, a bonus marketing opportunity. You get another chance to reach out to your customers, remind them of the awesome products they’re missing out on and offer them added incentives to follow through with making a purchase. More often than not, promotional emails that you send your customers get lost in the already existing chaos of their email inbox. With so many brands competing for attention, it’s likely that a percentage of your customers might lose interest and stop engaging with your emails. It may not seem like a huge deal, but as a great percentage of your list stops engaging, the greater the risk you run of damaging your sender reputation and your email deliverability rates. 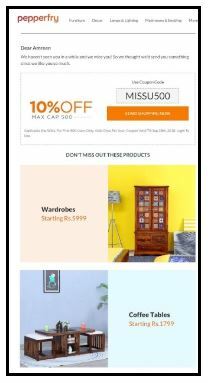 Online furniture store PepperFry sent me a re-engagement campaign with a 10% discount and a list of their top products. Because I haven’t interacted with them in forever, I did open their email and was pleasantly surprised to see they’d changed their email design – The colors were more vibrant, they’d begun including product pricing and the best part? The discount coupon was right at the top! There’s no way I could’ve missed that. Setting up a re-engagement drip campaign is a great way to show customers you care about them. You can take this opportunity to try new content and innovation approaches to see how you can bring your old customers back and get you new sales. It’s always easier to sell to your existing customers – You already know what they prefer; they already know what you have to offer. Win-win! Right from new product launches to beta-testing a new feature; your existing customers will be more than willing to try out stuff from a brand they know and trust. In comparison, potential leads might be skeptics when it comes to trying out something new from a brand they don’t know too well. But that doesn’t mean you mustn’t reach out to them. Any and all feedback and sales are great! For Fitbit users that want to track even more of their life, they can upgrade and try their new sleep tools. For potential customers, this is new software and tracking tool is an up-sell for the newest versions of the Fitbit product. Users with old versions of a Fitbit tracker, new apps are an incentive to upgrade. Cross-selling and up-selling your products is a strategy that any business in any industry can use. So if you’re a digital marketer, you could create an email on how to cross-sell products, and literally, cross-sell one of your other services through that email. As a small business, you might find it difficult to keep track of all our customers and where they fit into your . Similarly, you might not know what their preferences are, and sending them tailored content becomes a bit of a problem. Creating a drip marketing campaign solves that for you. If you can offer a planned set of drips—say a six-week course on how arrange flowers at your store or which bakery products fly off the shelves during holiday season —subscribers won’t just flow in, they’ll interact with the content at an incredible rate. Send stuff at random, and they may just ignore it. You can also use your weekly (or monthly) newsletter to engage with your customers. Along with giving them an update on your most recent blog posts and what’s been happening at your end, you can also include a link to a free downloadable e-book, or ask them to sign-up for an upcoming webinar. Haunted House Publishing is part of a community on Reddit. They’re very popular with readers who love scary stories, and one of my favorite online publishers. 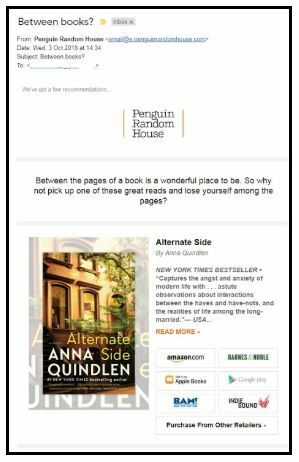 Every time one of their writers releases a new book, everyone on their mailing list receives a free promotional copy – and in exchange for this, they only want you to review the book on Goodreads or Amazon. Pretty sweet deal, I’d say! You’ll only know what works best for your email base if you test by sending them different, but relevant content. You could experiment with a three-part autoresponders series, but switch up variables such as your call-to-action or subject lines. See what works best, and then implement those practices moving forward. When someone unsubscribes from your mailing list, all you can think about is what went wrong and how you can avoid this happening again. But fret not. There’s a small window of opportunity right as someone hits that dreaded unsubscribe button – use an autoresponder to find out what went wrong and take one last shot at pulling that customer back in! 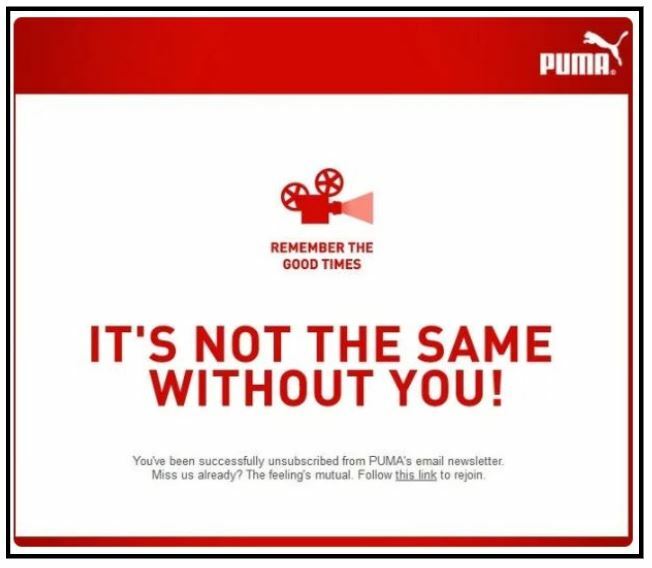 Sports retailer Puma takes a more lively approach with their unsubscribe confirmation page. They show an icon of a movie reel with the text, “Remember the good times,” and a CTA to rejoin if they would like to re-subscribe. People might unsubscribe from your email marketing list for various reasons. They don’t hate your brand, they might just prefer to interact with you in a different way. Use your unsubscribe emails to push other channels like Facebook or Twitter. Whether you’re a newbie or a seasoned email marketer, it’s not difficult to see just how important email drip campaigns are for your business. Drip email campaigns require patience, restraint, and nuance to strike the right tone and successfully nurture leads throughout the buyer’s journey. Drip campaigns help keep your business in the forefront of your customers’ minds. Quick recognition and recall will guarantee that your business will remain relevant, and drip marketing will provide these “reminders” for the customers. Still not sure if drip campaigns are the way to go? Check out our list on automated email ideas to get you started! The post 10 Best Email Drip Campaign Examples appeared first on Constant Contact Blogs. This entry was posted on Thursday, November 8th, 2018 at 9:01 am	and is filed under Email Marketing, News & Updates. You can follow any responses to this entry through the RSS 2.0 feed. Both comments and pings are currently closed.